Home › Low Settlement Offers › Why do people sometimes delay hiring an Injury Attorney? Many times people delay hiring an attorney when they are injured in a car accident, truck accident, motorcycle accident, bicycle accident, pedestrian accident, slip and fall, dog attack or on the job accident. Over the years Atlanta personal injury attorney Richard Griffin has spoken to many potential clients that say,“I wish I had called sooner, but I really just hoped I wouldn’t need an attorney.” Delaying hiring a personal injury or worker’s compensation lawyer is really not a good idea because without the guidance and protection of a lawyer there a lot of things can happen that can greatly reduce the value of the case. What are some reasons why people sometimes delay hiring an injury attorney? 1. They don’t want to pay an attorney fee: Not hiring an attorney to try to save money is a bad idea. A good injury lawyer will greatly increase the amount you will recover for your personal injury or worker’s compensation claim. One study that was done found that personal injury claimants who are represented by an attorney recover on average 3.5 times more than someone who tries to handle it themselves. It is always better to pay an attorney and recover a lot rather than settling for a very small amount and not paying any attorney fee. 2. They hope that the adjuster will do the right thing: Adjuster will always do the right thing for their employer, the insurance company. Adjusters will not often do the right thing for you. Since the insurance company benefits by paying as little as possible for personal injury and worker’s compensation settlements, the adjusters will almost always make low ball offers. The only way to even the playing field and to make sure the adjuster pays the fair amount is to hire an experienced injury lawyer. 3. They don’t want to litigate: With the Griffin Law Firm it is always your decision if you want to settle for the adjuster’s final offer or litigate. Hiring the Griffin Law Firm does not mean that you will automatically have to endure a jury trial. 4. They feel guilty hiring an attorney because they just don’t want to get an unjustified huge recovery: You should never feel guilty for protecting yourself and your family. Hiring an injury attorney means that you will only recover what your case is actually worth. It does not mean that you will recovery more than your case is worth. Small injuries usually result in smaller settlements. Big injuries when you are represented by an attorney, usually result in bigger settlements. Injury attorneys will make sure you know what your case is worth and will know what must be done to document your claim. Then they will fight to make sure you are fully compensated for your claim. In the below video, Atlanta injury attorney Richard Griffin is interviewed by Adam Goldfein, the host of Autoscoop and Lawyer Talk. During this engaging interview, attorney Richard Griffin explains that you should not feel guilty about hiring an attorney. Hiring an attorney is needed to insure that you are completely compensated for your personal injury and worker’s compensation claim. It does not mean that you are “socking it to” the negligent driver. Adjusters will normally not pay large settlement offers unless you have an attorney and unless your case involves serious injuries. It is wise for injured people to get a free consultation about their personal injury or worker’s compensation claim. 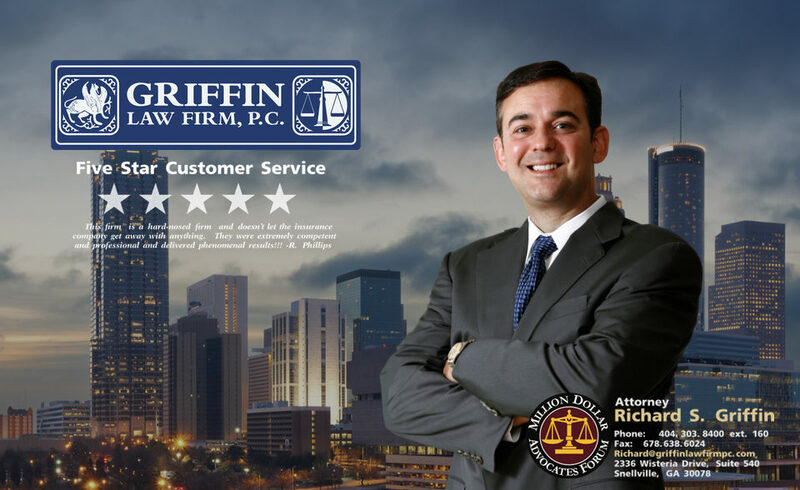 For a free phone consultation you can call the Griffin Law Firm. ‹ Worker’s Compensation – What are your rights to medical treatment and income benefits?